There are many accounting software’s used all over the world. Australia is also using several software’s which includes, MYOB, XERO, RECKON, SAASU, QUICKBOOKS, etc. All of these are important and essential and having little more than each other. These software’s entire are kept aside and SAASU are on one side with its distinct features and varied composition. ThisSAASU softwareis used by the various organizations on small or large level, internally or externally. 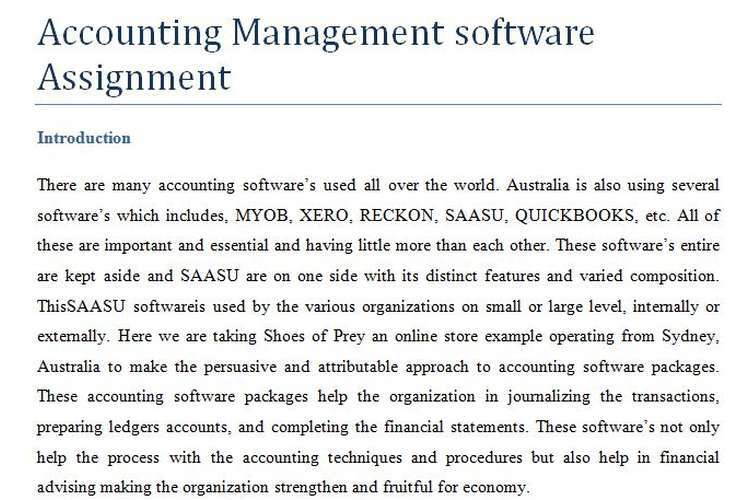 Here we are taking Shoes of Prey an online store example operating from Sydney, Australia to make the persuasive and attributable approach to accounting software packages. These accounting software packages help the organization in journalizing the transactions, preparing ledgers accounts, and completing the financial statements. These software’s not only help the process with the accounting techniques and procedures but also help in financial market advising making the organization strengthen and fruitful for economy. Marc Lehman and Grant Young in 2000 founded SAASU. Their process started with automation in the business which results SAASU from a side project to a full time business. Pan Global nominees and Cooper Sydney provides the minor investments to SAASU accounting package in 2000 which starts it journey and provide dynamism in the process(Courtenay, 2015). The various products of SAASU are as follows: Sales, Purchase, Inventory calculation, Payroll, CRM, Point of Sale (POS), Management of document and workflow, Tagging and Global searching, etc. (Courtenay, 2015). In the early 2000, Marc and Grant, two genius started a part-time software preparation for automating the business. This becomes to be a business in 2007. The software is promoted as a service model to software’s in later times. It started with an investment of $1 million with the Australian Pan and Global group which makes the business highly profitable and makes the most of the benefit in the industry. Its main focus is on cloud computing making the process dynamic and automatic making the process easy and definite(HOWARTH, 2012). Shoes of Prey are using this mechanized and automated software after its huge success. The reasons behind its usage are recommended by the friends of different organizations. This business is mechanized with the involvement of SAASU and recorded success. The process is diligently managed with the workflow and inventory and has huge potential to make the profits out of it(Cain, 2011). SAASU is automated software which has a huge market share in leading organizations of its field. A survey provides that around 17% of business is occupied by SAASU accounting packages. It’s a huge denomination in terms of its initiation. The other leaders in the market united enjoy 73% of the market shares. The rest small organizations satisfy with a composition of 10% of the market. From 2000, SAASU provides $125 billion downloads from 80,000 end number of users from all over the world. It was a part time company started as a project making it full time business in 2007 by Marc and Grant(King, 2015). There are various opportunities in the market related with the accounting packages. Hence there are numerous organizations started in this field providing accounting and financing services to the small and large setups making their process dynamic and diligent. The above mentioned companies are providing huge opportunities to their clients in terms of process dynamism and quality assurance(APN Newspapers, 2014). As such there are no gaps and challenges of the SAASU product and hence in last I would like to recommend that SAASU is necessarily required for the purpose of retaining employees. Automated process becomes assets for the business organisation. With the increase in the level of competition there is effective increase in the need of adopting a secure and automated tool for better performance and making organization strengthen. The best way of satisfying employees is always keep them motivated and involved in an automated process because satisfied employee didn't leave the organisation easily and shows their tendency to grow with the organisation. Increase in productivity: SAASU users and employees make effective contribution in the production as their efficiency gets increased. The level of working efficiency get improved for the SAASU enabled employees those results into increase in productivity(FOO, 2010). Easy to implement change: SAASU enabled process and employees are effectively adapting the change in their working process as they are aware about the benefits rendered by the change. They make effective participation in implementing the change within their process(FOO, 2010). Increase the satisfaction level: When employee getsSAASU software’s it increase their satisfaction level with the organisation. When employee gets satisfied they perform their activities with more dedication(FOO, 2010). Fall in conflicts, disputed, etc. : - SAASU enabled employees and organizations always focus over their enhancing their efficiency and it create such environment where they make effective coordination and build in harmony of feeling among them and management. These activities help in managing the accounts, reducing the conflicts, disputes and other harmful activities(FOO, 2010). Retain employees: When employee get software like SAASU or become satisfied then it is not easy for them to left the organisation and work with other organisation from zero level. This helps in reducing the share of employee turnover(FOO, 2010). After the whole discussion it is clearly concluded that SAASU is essentially required for the Shoes of Prey in order to make the process mechanized and automation and retain their employees. With the help of available traditional approached they try to make their process diligent but was forth shortcoming and hence they move on to SAASU. For this purpose they follow the friend’s advice in other organization using SAASU successfully. They follow all the majors in order to make the process successful. With the increase in the level of competition there is effective increase in the need of using automated accounting software’s as they helps in attaining required level of growth in their respective market. For organisation it is very important to manage their workforce or employees or financing. Management effectively take care of their employees but for this purpose they require special team who take care of issues related to workforce and inventory management. Earlier management is followed by the traditional approached in order to manage their inventories. The basic activities in order to manage the inventories are stock in and stock out, for employees it is orientation and training, giving wages or salaries, render incentives and benefits, performance appraisals, resolving disputes and build effective level of communication theories with process and suppliers. As the time passes there are effective changes made in this process and traditional approached get replaced with accounting packages. Shoes of Prey are largest customized shoe providers in Australia on the basis of sizes. They are effectively utilizing the package and diligently cam crossing with the changes in their process favourably. After the whole effective discussion it is concluded that Shoes of Prey effectively prefer the SAASU for the purpose of managing their resource, inventory and workforce in effective manner. SAASU is the updated version of the accounting management because earlier traditional approached is focusing over satisfying their employees and treated them as an input to get the desired output. Shoes of Prey get benefited with the use of the SAASU as their different department get the right person over their available jobs. SAASU helps in enhancing the skill set of their employees by rendering adequate training and development sessions and focus over reducing the conflicts among their employees. It automated the process and accounting transactions are lot more easily. They follow the performance management system in order to recognise or giver rewards to their employees by evaluating their overall performance. SAASU helps in identifying the performance as well for the organization employees and delivery channels. Cain, A. 2011, Bad times can be good for start-ups: My Small Business, Fairfax Digital, Sydney, and N.S.W. Courtenay, A. 2015, Robo advisers rise as humans come under scrutiny: MY SMALL BUSINESS, Fairfax Digital, Melbourne, Vic. FOO, F. 2010, Software helps Saasu save on meeting time, News Limited, Canberra, A.C.T. HOWARTH, B. 2012, No reason for firms to store their data in Asia - CLOUD COMPUTING - SPECIAL REPORT, News Limited, Canberra, A.C.T. King, A. 2015, Be a luddite in the cloud, but you will pay for it, Fairfax Media Publications Pty Limited, Melbourne. Which software is best in the cloud - MYOB, Quickbooks, Xero or Saasu? 2014, , APN Newspapers Pty Ltd, Toowoomba, Qld.